Just returned from Naples where we ate many pizzas from bad to great IMHO. 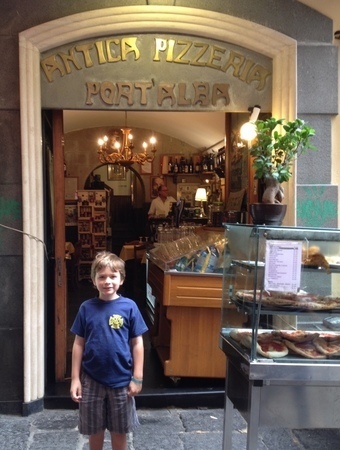 One of the best was at Antica Pizzeria Port'Alba in the historic district, they claim the be the worlds first Pizzeria. Another Pizzeria that we really liked was Pizzeria Zi Teresa on the waterfront by Castel dell'ovo. I was fortunate to have been invited into the kitchen at Port'Alba to watch the whole process from dough to pizza. My 7 year old even got to pat and shape the dough for the Pizzaiolo to finish. They use polselli flour which gave the crust a definite light almost fluffy and very flexible texture, asked about Caputo and they just laughed, said not so good - "non cosi bene". Ted, thanks for sharing your experience in Naples as well as the pics. I'm sure people on the site will love seeing them. The only 00 flours I've used are Tony's, Caputo (red and blue) and San Felice. Where abouts do you live in the US? And are you able to get decent Neapolitan pizza? We live in CA, San Luis Obispo area. Several restaurants have wood ovens but nothing resembles what we ate in Naples, I don't think thats what they are trying for either. My friend in town and I have wood ovens and we produce pretty good pies IMHO. I never seem to get the results exactly the same every time probably because I am always experimenting with ingredients. You're welcome Ted. Having access to a high temperature oven is key if that's the style you're going for. Everything else shouldn't be too hard to source in your area. Good luck with your pizza endeavors!